Open/Close Menu Maori Warriors were some of the fiercest warriors the world has ever known. Their bravery and savageness are legendary. Throughout their history war was a part of Maori life. Conflicts over land and insults of any type were the main catalyst for war. As Europeans began to settle New Zealand wars broke out against them. War among the Maori became an endless cycle, upon defeat the losing side would feel obligated to restore its pride (mana). 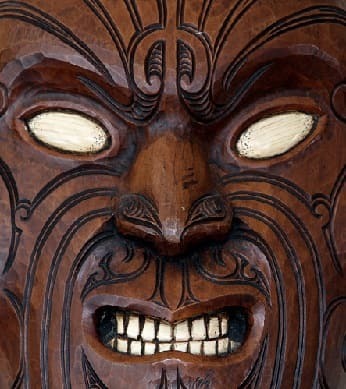 Below we have listed many interesting facts about Maori warriors. This information, written for kids and adults, includes how the Maori fought, what weapons they used, and the reasons why they fought. The Maori fighting unit was called a hapu. A hapu rarely consisted of more than a few hundred warriors, often numbering less than one hundred. Most of the warriors were men but women were also known to fight. Often several hapu joined forces in battle. When more than one hapu did join forces, they would not coordinate the battle together, each would basically do as its chief dictated. This lack of coordination hurt their effort and could lead to defeat by a smaller war party. The warriors were usually lead by a chief. The chiefs main job was to motivate his warriors to move forward. The chief was a huge motivational force and if he were killed or wounded the warriors would usually retreat, even if on the verge of victory. Warriors would usually travel to the battle by foot and usually in single file due to the narrow paths they traveled. Sometimes they would travel in large canoes to get to a battle. The main strategy employed by the Maori was ambush or surprise attacks. They would quietly work their way close to the enemy and then launch a quick and deadly attack. Dawn was the favorite time to attack because the night helped the warriors approach undetected. So important was the eliminate of surprise that if it was discovered that the enemy was aware of their approach the warriors would often postpone the attack. They also used other surprise attack techniques. For example, the warriors might pretend to be on a hunting or gathering trip and work their way close to the targeted village. When close enough they would spring their attack on the unexpecting adversary. They were also known to attack other tribes that had been invited as guest or that were hosting a ceremony. Upon victory, and in fear of revenge (utu), the victorious tribe would usually kill all the enemy warriors, who were not lucky enough to have escaped. Below we have listed the main weapons use by the Maori. For more information about these weapons click here Maori weapons. The Maori were trained to be warriors from an early age. They used sticks to practice spear thrust and padded weapons to train for combat. They learned to wrestle, box, throw rocks, and run. Before going into battle the Maori warriors would prepare themselves in several ways. This usually included abstinence of certain foods and practices and the performance of a war dance called a Haka. During this dance, the Maori would wave weapons, stick out their tongues, bulge out their eyes, wave weapons, and grunt. This dance was very important, the tribal elders would watch it and if the haka was not performed correctly it could be considered a bad omen for the upcoming battle.